Sundays are a “Car Guy” (and Gal) spectacular at Phil’s Filling station. 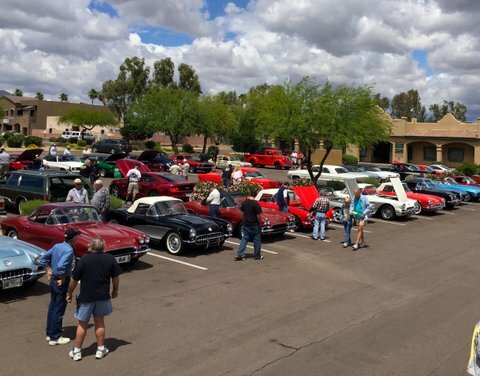 One of the Valley’s biggest collector shows happens every Sunday between October and April in the parking lot of Phil’s Filling Station Diner. The show often sports more than 100 cars, from customized Street Rods of the 50’s to classic restored cars from the turn of the century. Like Chrome? Craving a Chocolate Shake and Burger? This blast from the past is a great way walk down memory lane; with a reasonable meal (Phil’s menu has more than 60 classic diner items, so Sunday dinner can wait too!). 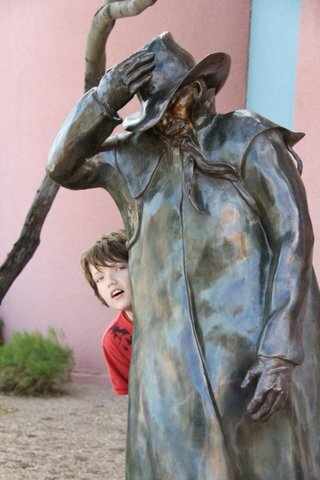 The Town of Fountain Hills Public Art collection provides at least 100 settings to take amazing photos with your seasonal visitors. The sculptures in the Community Center area provide a fun background to creative photos that are a big step above the boring, “Say Cheese” group pictures we all have in our collections. The area has on-site parking and is handicapped-accessible, making it a snap to snap festive pictures and enjoy a major part of the collection in close proximity. Kids love to clown around with the whimsical pieces at the entrance to the library, but there are opportunities to capture the majesty of our mountains and the fountain as well. 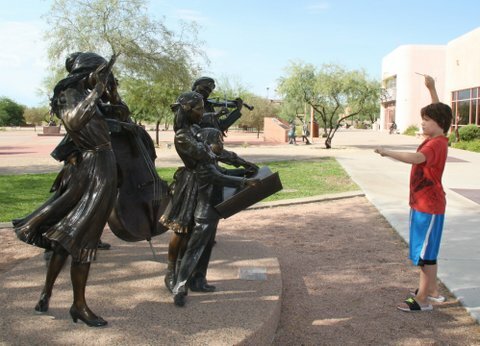 Taking in the docent-led tours are organized around the collection in the Community Center area and Fountain Park are a wonderful way to showcase the rich Cultural resources of Fountain Hills. Docent-led tours are given each week from October to April as well. 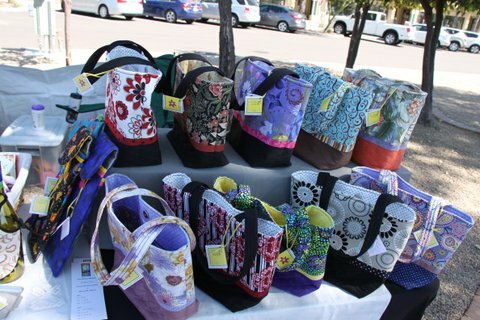 Every Thursday, during Art on the Avenue, an impressive gathering of artisans bring their one of-a-kind creations to the Avenue of the Fountains. Some of the art work is southwestern-themed, and many photograph, cards, paintings and home décor items feature our breath-taking mountains. Gift items abound, as well as beautiful items to bring life and color to everyday use. The Fountain Hills Artists Gallery, Sunset Gallery and Gridley’s are also on the Avenue of the Fountains, and provide enjoyable browsing between snacks at Sofrita or the All American Grill. These local restaurants have outdoor seating to boot…just one more way to showcase the pure pleasure of living in Fountain Hills. Crusin’ the Oldies but Goodies at Phil’s Filling Station Diner! 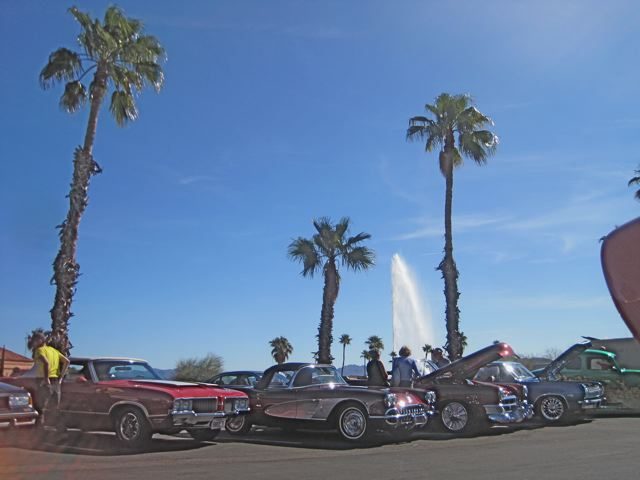 Come out and look at these beautiful collector cars while enjoying the backdrop of our World Famous Fountain! While you’re there, be sure to enjoy the great culinary offerings at Phil’s Filling Station, where they serve up a great menu of everything from Greek, Italian and Mexican to down home good cooking. Phil’s does a great job of providing a gluten free menu, and their bar is always a good place to watch the game. They are open 7 am to 9 pm for breakfast, lunch and dinner! You could enjoy this view all year round if you lived here! Check out their website at www.philsfillingstationgrill.com. For more information on Fountain Hills and the surrounding area, you can get relocation information from Sonoran Lifestyle Real Estate via the relocation guide at http://www.150ways.com or at http://www.SonoranLifestyle.com . Check it out for all that is going on in Fountain Hills.